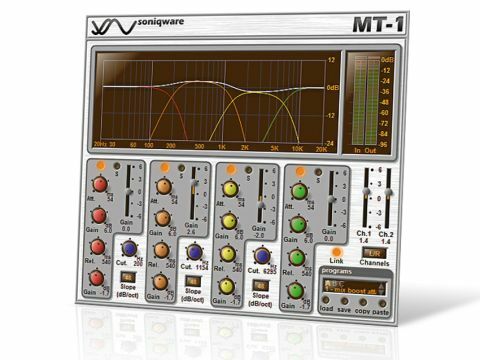 MT1 is easier to use than your average multiband dynamics processor, with a different sonic flavour to boot. Reasonably easy to use. A/B/C comparison very handy. Impressive sonic results. Clean sound. Preset system has issues. Some annoying interface quirks. It can be beneficial to split audio source material into separate frequency bands (eg, bass, midrange and treble) for processing purposes, and multiband effects are now commonplace in the computer musician's plug-in folder. While they can be harder to get to grips with - and can do more harm than good if used incorrectly - they do give you a degree of control and flexibility that's not found with single-band processors. Compression, limiting and distortion are typical processes you'd find in multiband form, but MT_1 from Soniqware is a little different in that it's a transient processor - it enables you to boost or subdue the attack and release portions of your signal independently, in four frequency bands. The interface is much like any other multiband effect, with a graph displaying the crossover points and separate controls per band. The linear-phase crossovers work in a straightforward manner, and have three slope options (12dB/24dB/48dB per octave), and adjustable crossover frequencies (the minimum width of any one band is an octave, eg, 1.2-2.4kHz). The fun begins when you start using the controls to adjust the transient content of each band. You manipulate the attack and release (aka sustain) stages using gain (-/+12dB) and time controls for each. The latter dictate how long the attack and release stages are boosted or attenuated for, with ranges of 1-100ms for attack and 10-1000ms for release. For instance, with a short attack time, you can add a sharp 'click' to the start of a drum sound, whereas longer times will give more of a brutal punch. There are makeup gain sliders and solo/bypass switches enabling each band to be auditioned in turn - handy for fine-tuning settings. "MT-1 is a transient processor - it enables you to boost or subdue the attack and release portions of your signal independently, in four frequency bands." One downer is that the makeup gain is applied even when a band's processing is bypassed, making it hard to set up 'like for like' comparisons. Also annoying is the fact that there's no global reset button, and resetting band crossover points can shift them to illogical positions. On the plus side, the global Link switch enables you to (relatively) adjust the controls on all bands at once, which makes dialling in the exact amount of attack/release gain on all channels easy as pie, though, as we've said, a global reset button would be handy to return a preset to its default state. Highly useful when dialling in any kind of subjective effect processing is good old A/B comparison functionality, which enables one to flip back and forth between different setups. The effects of dynamics processing can be quite difficult to judge, so we were pleased to see that MT-1 comes with A/B/C banks as part of its built-in program manager, with each bank containing 16 slots. You can load a preset into each bank, then flick between them by selecting A, B or C, or simply create them by clicking on one and dialling in your own setups. One downside is that browsing about in bank B takes the A and C banks to the corresponding preset slot, slightly reducing functionality. More worryingly, trying to load a saved preset using MT-1's preset manager resulted in an error stating that the FXP file was "inappropriate", though we were able to save and load via Cubase's preset system without a hitch. Worth mentioning is that the MT-1 can operate in stereo, left or right channel-only and mid/side modes to boot. In operation, we attained some impressive results working with mixed-down percussives, with the multiband format enabling us to single out snare drums or hi-hats to be embelished with extra bite (or less, as the case may be). You can add thump to kick drums or, by pulling down the release gain of the lower band, reduce rumble, a bit like an expander. It's also great for fine-tuning and manipulating toms, and we achieved decent results on isolated sources such as bass and vocals. When you want to add more attack on mixed program material, shortening the release alongside boosting the attack helps make the sound more percussive. MT-1 is currently held back slightly by a few annoying glitches, but they're not dealbreakers, and SoniqWare says that it's working on an updated version that should put paid to them. Considering the sonic results MT-1 can achieve, we'd recommend giving it a try if you're after a more advanced transient-shaping solution.